Follow up question, why is there a password on the .doc that comes in the zip from inconcert? If i can get away with it I don't and just send the key emulation commands which I think is the best way as long as the user can see the Polycom OSD. If I have to supply an address book I use a module because it would be a big task writing that myself. As the RealPresence Group series codecs don't support keypad emulation I use IR if possible otherwise the module. I have not come across a zipped doc, now that's taking closed source to a new level! Just as an update on the Group Series key emulation.. I believe this is now available with the latest RealPresence Group Series Software release 4.1.3. 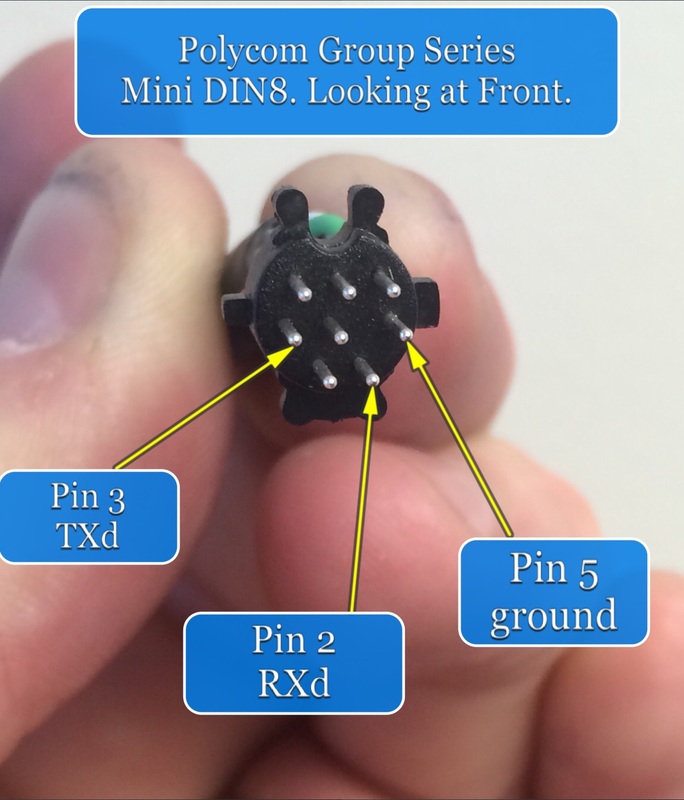 Has anyone had any luck with the D9M to 8 pin mini-din cable required to connect to the Group Series 500 codec? I've made one as per the spec in the integrator's guide but am having no joy. Any help would be appreciated. Just wondering if anyone has used the RPG Module, I've got the majority of it running but the Address Book is only reporting Local and not Global, has anyone got the Global Address Book coming back into the UI? i upload the demo program to confirm it's not my code and change the device pointing for the address book to the global addressbook and same thing. probably need to call AMX on that to figure out why. Firstly, Polycom have been known to change the behaviour of the API. I'm not saying that the API has changed. I've never used the module as I have my own. The first steps would be to check if the codec is responding to API requests. - Type "gaddrbook all" without quotes. This should return with the addresses. If this does, then the module isn't working. If by chance no addresses are returned, check the codec UI to see if they are there. If they are not, check the global settings. If they are, make sure they do not show up under the favourite category as anything there will not be returned via the API. There is a setting to show global addresses under favourites (can't remember exact wording). Turn this off. Hope something may have helped. I have made some test without the duet module and you have to send a range command to get a response from the unit. Using an ID different than ID=* give you a response but look like the data parsing doesn't work properly. That's interesting as my module uses that command and all works well. I'd say maybe a Polycom bug as the format for the response should not have changed. It's the same as the local address book. One thing I have noticed is that global address books can be upwards of 1000 entries and I don't know if the AMX module works. I have since heard that the Global Address Book wasn't tested and I can confirm that it doesn't work, doing a Passthru-gaddrbook command works and you can see all the results but can't bring it in to the system. It only supports the local address book, I have been told AMX / Polycom are both working on it so hopefully it should be fixed soon. There are a few things not apparently supported by the RPG such a button keys & directory buttons so you have to navigate yourself to the address books. That sounds about right, hence why I use my own module. The module seems to only return the H323 or SIP numbers from the phonebook, and not the office/mobile/etc numbers. I can see them coming in from the device, but the module doesn't pass them out. Is there a module setting or something that I'm missing? I'm struggling getting the module to function on anything either than port 1 of my touch panel. Can anyone please comment on what I might be doing wrong? If I change my dvTP to 10002:5:1 and change my button channels to 5, I get feedback, but no control. First Group series 700 straight out of the wrapper and on the bench today. Rolling my own module. Already some issues. The API screen command is mostly useless. This cmd supposedly allows you to track where the gui is (sure used to on hdx even tho a bit dodgy too), but so far only home works and even the demo cmd of 'adminsettings' in the Polycom manual doesn't work. If the remote moves the gui around, the Api is not advised even with the screen 'registered'. And so if you want to force the gui to the phone book for instance, you are going to have to guess the command as a list of screens is not available. Created a dial and subsequent hang up and then pressed the home button which flipped the gui to the home screen and instantly invoked a redial!! Wouldn't stop doing it. Reboot fixed that. Nice. Not sure I would even attempt the prefab module - looks like a lot of workaround is going to be needed as it is and you will be better off rolling your own IMO. Firstly, welcome to the world of Polycom API. Your first observations are correct. The API in the Group series are "buggy" to say the least. There are ways around most of the API limitations. To find the screen names, request the current screen. Please be aware that Polycom have been known to change these names though. I use my own module and limit the home screen to display minimal information. All contacts and call management and codec control is via the AMX UI/code. There are lots of other annoying things you will notice as in the PIP command has changed to SELFVIEW, or the content commands need to be supplied the content camera. If you need any help, shoot me a pm/email. Im just around the corner. I couldn't get anything to work in my own programming without invoking the channel codes they have connected to the Nav Submenu in their UI. Much trial and error remains with this module as these (and probably lots more) are undocumented. I learned you should not use all the module in demo program. If you want to do some Custom programming you should look at the demo module and use what you need. I create my own module to follow the actual ui use by the Polycom touchscreen. The only issue I'm having right now is to use the global directory. It not populate correctly like the local directory. I have not yet finalize that section of my module because I didn't have access to a Polycom group series with a global directory. The ir emulation is really bad on the group series I'm only using the arrow, enter, back and menu. I have programmed a simulated polycom codec for both HDX and RPG models. Please note that some of the code has been written by others. If you use this code as a test then it doesn't work out on site, then there is most likely an issue with the codec. Cheers Craig - thanks for sharing. working out which pin is which, however, from their diagram, is less easy! If the wring is like the serial cable for Polycom VSX series the pins are NOT straight thru or crossover of 2,3 and 5. I made up (and verified) a Polycom serial cable a couple of months ago. If I can find it I will post the pinout here for you. Hi Craig - would love to get a copy of this but appears the link is dead - any chance of still getting it? I have moved the files to https://owncloud.atkin.id.au/index.php/s/TwPHAweBhbxEnaL as i am now using my own could service. With regards to the module, this isn't a full simulated codec. Its only parts of it that can trip up comms modules. I don't know if any one has access to a RPG with current firmware with RS232 control as I was wondering what the RS232 spits out when you enable usernamepassword in the webUI? I am starting now on building my own VC module - its the only one I use from AMX (Polycom and Cisco) and keep getting caught when they change firmware. The Cisco modules I have worked out but the group series is a pain e.g pulsing channel 131 (send content) on the AMX module tries to change to input 6 and on the 500 there is only 3 inputs. I have got updates for these modules before when something was wrong but time to build my own I think. Now looking at the picture, that does look like the same pin-out I had to create for the VSX I had. Polycom kills me with their proprietary cabling... they try to bilk you several hundred dollars for their cables. Makes me wonder if they share engineers with Apple. That is precisely why I don't use duet modules for codecs. They like to screw around with the command API between firmware versions, rendering some features broken. When we got our first C90, the latest module AMX had was for TC4 and the codec came with TC6 on it. I knew right away the duet module was not going to work for me. As much of a PITA it is to write your own, it will save you headaches down the road. The "Do Not Disturb" function is not working. It is channel 303. When I reboot the system it will turn it off once and then it doesn't work again. I tried using it in "Control a Device". I have an HDX 8000. It turns out that it is working as it should. The button on the Polycom screen doesn't change the way it is supposed to. I need to update the Polycom system software.